We’re finally finished with our Thanksgiving leftovers but the Sailfish, Blackfin Tunas and Sharks are still hungry for more in South Florida. Here at Fantastic Sportfishing, we don’t take holidays off when drags are screaming and coolers are getting stuffed. The Thanksgiving Holiday causes us to take a moment to thank YOU for giving us at Fantastic Sportfishing the opportunity and privilege to introduce YOU to this unmatched South Florida fishery. Without YOU, our Team has no mission. We greatly appreciate your business and hope that you’ll come back to see us soon, especially our junior anglers who are looking forward to the upcoming holidays and holiday travel to visit family and friends. 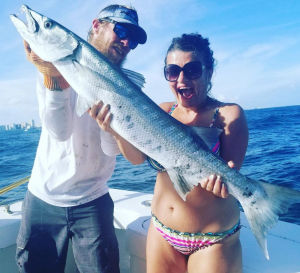 Keep in mind that Fantastic Fishing has trips available this holiday season should your travels bring you to tropical South Florida. The Fall weather patterns have caused the recent baitfish migrations to settle in around the reefs just offshore. 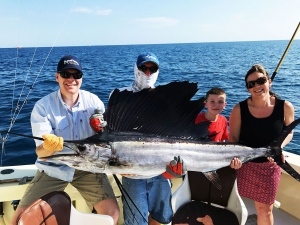 This has caused not only species such as Blackfin Tuna and King Mackerel to stick around but also pods of Sailfish who, like our seasonal “snow birds”, make their winter trek down to South Florida to escape the cold. Our morning and evening trips continue to keep our clients excited…and a bit tired from reeling in so many fish. The pods of Sailfish are here and feeding on the huge schools of Ballyhoo as they make their way south down our beaches. 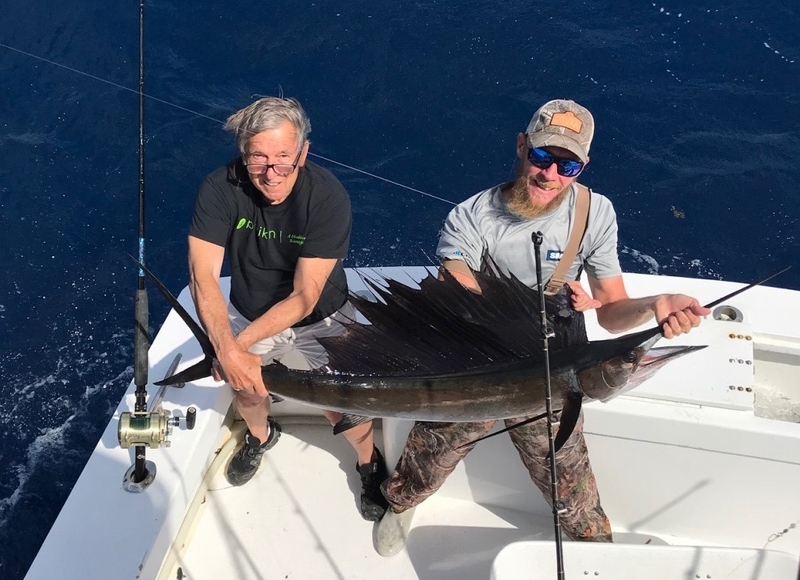 We continue to catch multiple Sailfish on slow-trolled live Ballyhoo or on live Goggle Eyes suspended below our fishing kites. South Florida is the birthplace of kite fishing and nobody does it better than the pros at Fantastic Sportfishing. We been catching Sailfish anywhere from 60 feet out to 300 feet of water. When there is not enough wind to keep the kites in the air, we’ve also had success catching Sailfish trolling Sea Witches (in blue/white and pink/white color combinations) on the surface at 7 – 9 knots. The Sailfish bite will only get better as we make our way to Winter. Blackfin Tuna Cyber Monday “On-Line”! The Blackfin Tuna bite continues to be epic! The Tunas are still active up on the reefs inside of 200 feet of water and are responding well to trollied Sea Witches and Bonito Strips at a speed of 5 – 6 knots. 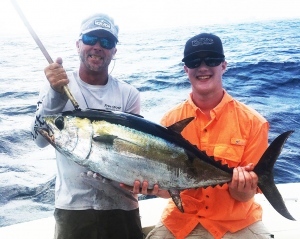 We’re averaging 15-20 Blackfin Tunas on every trip right now, with the size ranging from 8-12 pounds. Now that you’re burned out on turkey, let’s bring home some Tuna for dinner! There are also “bullet” bontios mixed in with the tunas and we’re using them as live baits for Grouper, Amberjack and Sharks. Kingfish are especially active right now as the Ballyhoo schools have settled in for a few weeks now on the reefs. 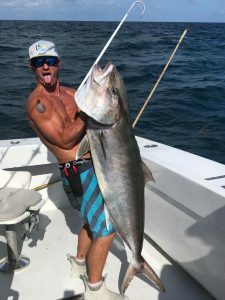 Kings have been plentiful in the 12 to 30-pound range between 80 and 120 feet of water, with bonito strips, lures and feathers trolled below the surface on planers producing the most fish. “Kings” have also attacked our live baits on the drift as we target Sailfish in 120 feet of water. As you can see here, Kingfish aren’t the only “toothy critters” on the prowl. Barracuda have moved in on the bait schools too and will make anglers pay the price if they’re not fishing wire leaders. The shark fishing continues to be solid with some Fantastic catches mixed in. We continue to average between 1 and 2 sharks – or more -each trip. We continue to tangle with Blacktips and Spinner Sharks as they chase the migrating baitfish. We also caught a 150 pound Bull Shark and a Hammerhead on both live Bonitos and butterflied Bonitos/Kingfish dropped down in 300+ feet of water. We’re also introducing our clients to the offshore version of Crossfit Training: Amberjacks! We’re dropping down a live Bonito or Goggle Eye in 200 – 300 feet of water to slug it out with huge, bruising Amberjacks. Take a break from shopping and join us offshore for a different kind of “Sail.” Plus, there is no snow in the forecast. Ever. Give us a call to book a trip with Fantastic Sportfishing.